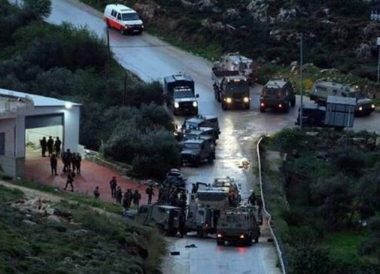 Israeli soldiers killed, on Monday at dawn, two Palestinians, and injured one, after the army alleged they tried to ram them with their car, wounding two soldiers, in Kafr Ni’ma village, west of the central West Bank city of Ramallah. 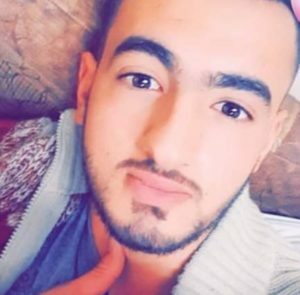 The slain Palestinians have been identified as Amir Mahmoud Darraj, 20, from Kharbatha al-Misbah village, and Yousef Raed Anqawi, 20, from Beit Sira village, west of Ramallah. The wounded young man has been identified as Bassem Jom’a Alqam, 20, from Safa village, west of Ramallah. The Israeli army stated that two of its soldiers were injured, one seriously, when the Palestinian car “rammed into them in the village,” and added that the soldiers opened fire at the car, killing two and mildly wounded a third. It added that the soldiers stopped to the side of the road, close to the exit of the village, when the car reportedly rammed them. The army said the soldiers had to stop on the side of the road due to a mechanical error with their jeep, before the Palestinian car rammed into them. 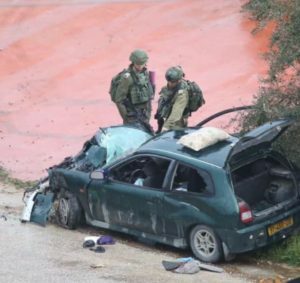 Palestinian sources said that the incident was a traffic accident, and not a ramming attack as the military claims, as the driver and his passengers could not see the soldiers before hitting them with the car. The Palestinians car slid due to the wet road, before it struck the army jeep, they added. Khaldoun ad-Deek, the head of Kafr Ni’ma Village Council, said the accident happened in an area of a difficult terrain with rough and curvy roads. The three Palestinians worked as guards at Nour al-Hoda Schools in Betunia town, west of Ramallah. It is worth mentioning that the many army jeeps invaded the village, and conducted extensive searches of homes, before abducting several Palestinians, in addition to opening fire at protesters. The soldiers placed the village under a strict siege, after closing all entrances and main roads. 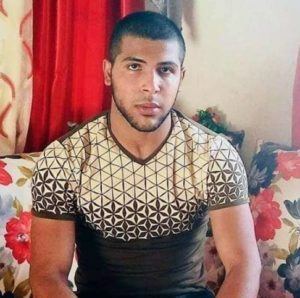 On Sunday at night, the soldiers invaded the village before storming and searching homes, and abducted a young man, identified as Yousef Mahmoud ad-Deek. Many Palestinians suffered the effects of teargas inhalation, after the soldiers fired gas bombs and rubber-coated steel bullets at Palestinians protesting the invasion. The soldiers also attacked, on Monday morning, several schoolchildren, and hurled gas bombs and concussion grenades at them, in addition to preventing them from reaching their schools.